The famous Winchester Model 98 Breech Loading Cannon was first offered for sale in the 1903 Winchester catalog. The barrel, machined from solid round bar, is mounted on a cast undercarriage as it was when manufactured by Winchester. The barrel and undercarriage have a durable electro-coated finish, and the breech closure is hardened black. 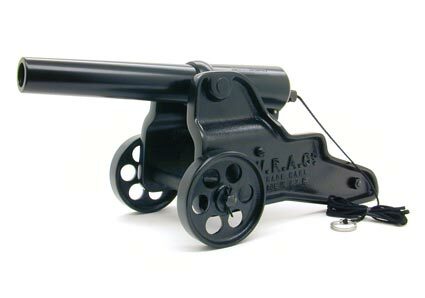 The Standard Black Winchester Cannon is available factory direct from the Bellmore Johnson Company. For pricing, availability and ordering please visit The Cannon Store or telephone, toll free: (800) 575-2171.